He was, of course, explicitly talking about paint on a canvas, but his words speak more universally to the need to shift perspective and to risk failure. The tenet that getting into action–even “wrong” or misguided action–is productive and even necessary for change is at the heart of coaching. Taking action gives you data. The first line on a canvas or page, the initial prototype of a product, the informational interview–all get you out of your head and reveal new information that you cannot access when you are stuck in analysis paralysis. Once you are in motion, it is easier to take other actions. Compare turning a boat, car, or a bicycle from a stop as to when it is already in motion. Many people learn this when they take a new job after a long time in a job and find that their next move is easier. Acting without certainty about the results is essential to innovation. If the results are guaranteed, there is no learning or growth. Trying something new keeps you flexible. Just as a new yoga pose stretches different muscles, trying something new provides the opportunity to stretch your thinking and your skills. Taking a new perspective allows you to see options. From a new vantage, you eliminate blind spots and identify new paths forward. Even a single spot of paint makes you see the canvas differently. Sometimes the unexpected is really cool. 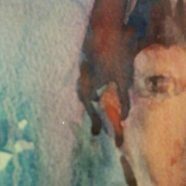 My mother-in law, a watercolorist, will tell you: watercolor is hard to control – it runs and blends. Sometimes the results are a blurry mess. But other times, something miraculous happens. The artist has to surrender some level of control for that to occur. The rapid pace of change and the increasing complexity of the world demand that more of us stretch into new spaces where the outcome is uncertain. So when you find yourself facing your equivalent of a blank canvas in work or life, pick a color and make a mark. Creativity is not just for artists, y’all.